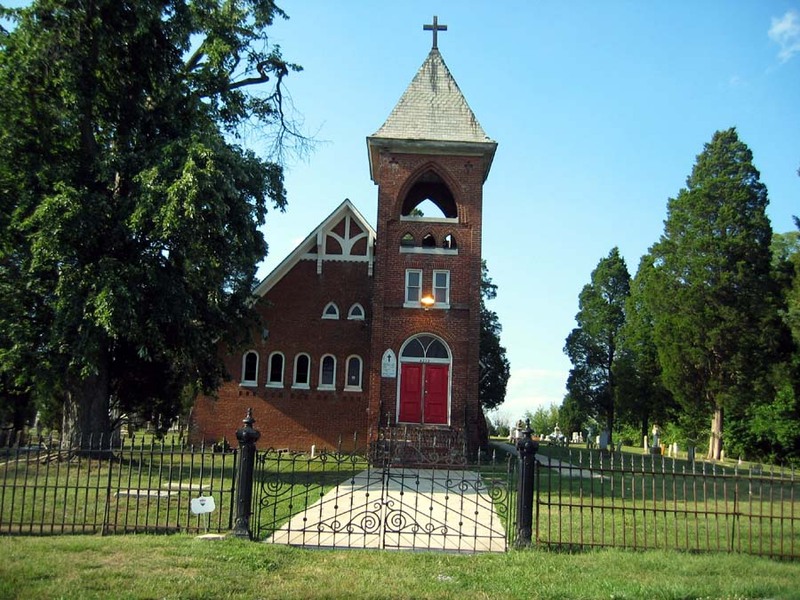 St. Mark’s Episcopal Church – St. Mark’s Parish was established in 1789 when the lower portion of the Middletown and Pleasant Valleys were separated from All Saints Parish. The parish church was placed in Petersville and the first vestry was elected in 1800. A frame or log church was erected on the site in 1807 and consecrated in 1819 by Bishop James Kemp. This church was replaced in 1830 with a brick structure which was consecrated in 1831 by Bishop William Stone. Under the pastorate of Rev. Edward Trail Helfenstein (later Bishop of the Diocese of Maryland), the parish expanded to encompass four churches (St. Mark’s – Petersville; St. Luke’s – Brownsville; St. John’s – Burkittsville; and Grace – Brunswick). Rev. Helfenstein also led in the construction of the present St. Mark’s Church, which was completed in 1891. The brick church displays both Gothic Revival and Romanesque style characteristics. St. Mark’s Church closed in the mid-1960s and is used by an Apostolic congregation today.